Protest club FC United of Manchester may need to apply for an overdraft in order to address its "worrying" financial position. The National League North outfit, set up in 2005 as a protest to the Glazer ownership at Premier League side Manchester United, is anti-debt. But it is struggling to meet its financial targets. It told members: "Our finances are behind where we expected in a number of areas." "The board needs to alert supporters to the possibility that the club will need to apply for an overdraft around December 2016. We are in a worrying financial position." 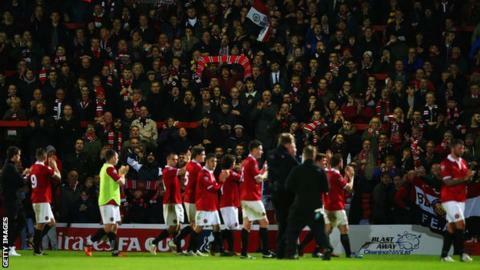 FC United of Manchester: The protest club at war with itself? The club is heading towards making a loss this year that, in addition to needing an overdraft, will leave it unable to meet obligations for further development of their Broadhurst Park ground at the end of the season and leave it with insufficient funds to pay other lenders. Among the reasons given for FC United's financial plight are a staffing structure deemed "not fit for purpose" and an "unrealistic" financial plan for 2015-16 and beyond. The club hoped to avoid such a dire scenario when it appointed a new board in the summer, ending a period of bitter infighting that had led to a number of well-established figures at FC United relinquishing their roles. At the time, officials spoke optimistically about the future but this season, their second at Broadhurst Park, which cost £6.3m, average league attendances have dropped from 3,208 to 2,440. In addition the club failed to match last term's run to the first round proper of the FA Cup, which brought in £150,000. On Saturday they entertain Nuneaton in the third qualifying round of the FA Trophy. Read more on FC United of Manchester: The protest club at war with itself?